Click here to read more about general system settings. Click here to read more about supplementary options. Click here to read more about viewing licence information. All options under the tab ‘type of leave links’. This rule is intended for Belgian legislation. In case a holiday occurs in the weekend, employees will get an extra leave day. By selecting a type of leave here, the system will automatically add these extra days to the type of leave by means of the holidays as they were entered into the system as special days. Settings for special days can be found under ‘Master data’ ⇒ ‘Special days’. By selecting ‘on Saturday’ or ‘on Sunday’, you can determine for which weekend day this rule will be used. In case you are using the time registration module, you can link the ‘sick’ type of leave to this function. If you have not done so already, you first need to create the ‘sick’ type of leave, and it should be added to all employments. 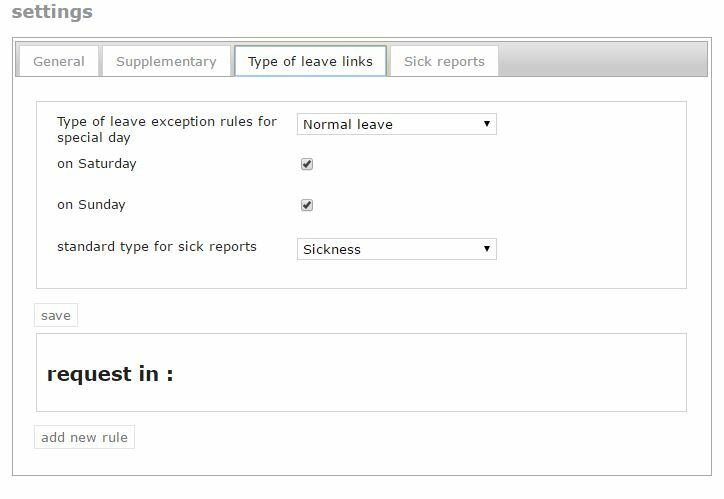 This way, the days reported sick will be linked tothe ‘sick’ type of leave when using the time registration module for reporting sick.